With a new calendar comes the urge to start anew in every aspect of our lives: Come January, we resolve to clean up our act, whether it's committing to a healthier lifestyle, unplugging from our devices more, or upgrading to an earth-friendlier car, to name just a few examples. Another popular promise to ourselves as we approach day number 365? Kicking off the New Year with a completely fresh nest. Scientifically speaking, the desire to maintain a tidy home can actually make you healthier. As Psychology Today points out, one study found that people who kept their homes clean were physically healthier and more active than those with messy abodes, while another study discovered that women who described their homes as "cluttered" were more likely to be fatigued, depressed, and stressed. If that's enough to convince you to bust out your dustpan and labeling machine, consider this New Year Home Organization 101. "A new year is a great time to evaluate what is working in your life, and set intentions for the future. 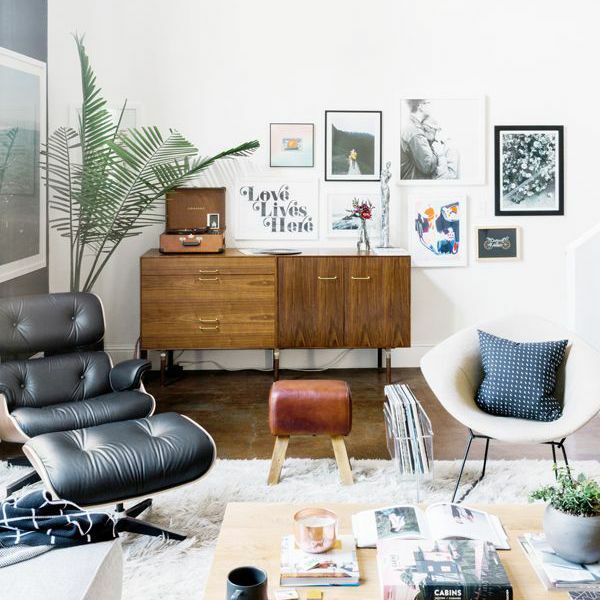 If your space has become filled with physical clutter, this can create an underlying feeling of stress or of being stuck," professional organizer and Composed Living founder Elsa Elbert tells MyDomaine. "I often find in working with clients that when they begin to address the build of of physical items, they make room for positive change in the rest of their life." If you've decided to adhere to a KonMari-like lifestyle or become a more organized person, take note that successfully following through with your tidy new habits requires specificity and a clear, small action that's easy to do for the first week. Behavioral scientist Susan Weinscheck, Ph.D., explains that the intention to eat healthier would be more effective if you commit to taking the stairs instead of the elevator every morning or drinking a smoothie with more greens, for example. With that in mind, consider challenging yourself to start with simple tasks, like recycling any junk mail as soon as you get home or doing laundry every Saturday morning. If there's one place you should prioritize when it comes to New Year home organization, it's that random junk drawer—you know, that one filled with "old pens, pocket change, wires and cords, batteries, and all other things that simply don't have a home," says Elbert. "Devoting one to two hours to clearing this clutter will provide you with so much peace of mind in the coming year." The organization expert also points out that you don't have to sacrifice style when you're revamping your space. "Invest in [decor] pieces that will work well in all seasons," she recommends. For example, "new throw pillows and a cozy blanket can help keep the [living] room feeling fresh with each changing season." Scented candles and lights that dim can also refresh the room with a warm, cozy atmosphere, she adds. Keep your schedule clear this weekend and prepare a donation box: Here's your expert-approved checklist for organizing and decluttering every room in your home for the New Year. Clear off all surfaces—then, "get a beautiful plant, or a photo that makes you smile. This is the first thing you, and your guests, see when arriving at home. It should be beautiful, clean, and happy," says Elbert. Stock up on stylish storage baskets for stowing away shoes, umbrellas, and other items. Identify anywhere clutter accumulates, like coffee tables and console tables that serve as "catch-all" places for items. "Store smaller items in beautiful baskets—this keeps them accessible, while removing visual clutter," says Elbert. Recycle last year's magazines or donate them to your local library. Sorting through your junk drawer can be a lofty endeavor on its own, so consider focusing on just getting rid of items like old receipts, dead batteries, orphan keys (you know, the ones to your old apartment), and other things that can be easily dealt with. If you frequently use video streaming sites like Netflix and Hulu and listen to all of your music on Spotify, it might be time to let go of your old CDs and DVDs. Consider donating them to the library or reselling them online. "Get a good filing system! This is crucial for keeping paper documents organized and out of sight," suggests Elbert. "Set up auto-pay for your bills, and subscribe to electronic statements. This saves you money on stamps and envelopes, ensures your bills are paid on time, and saves the environment." File away any loose papers—or better yet, scan your documents or use a digitizing service to go paper-free, then shred everything. Recycle all of your old receipts (and don't forget those crumpled-up bits of paper at the bottom of your bag, too). If you're saving them for tax write-off purposes and already use an app like Mint for tracking your finances, you can easily categorize transactions to write off. Recycle product manuals, especially the bulky ones—most of these can be downloaded as PDF files online. Throw out any writing utensils that are dried up or no longer usable. Sort through all of your glass and plastic food storage containers and throw away anything that's missing a lid or a bottom. Throw out any expired foods, including leftovers in your fridge and canned or dry goods in the pantry. If you have any uneaten non-perishable goods that you know you won't eat and that haven't passed their expiration date, consider donating them to a local food pantry, says Elbert. Rearrange all of your spices in alphabetical order. Stack your canned foods by category: fruits, vegetables, beans, meats, and so on. If you're committed to the project, overhaul all of your kitchen storage. "Amazon sells amazing stainless steel pull-out shelves for kitchens," says Elbert. "These are easy to install, come in a variety of sizes, and are incredibly helpful for creating easy access to the back of your cabinets." Throw away stained bedsheets and blankets. Buy under-the-bed storage boxes to stow away duvets, bedding, pillows, throws, and other items. Keep a small trash can for throwing away receipts and other pocket clutter that might otherwise land on your dresser or bedside table. Use over-the-door hooks to store accessories or for hanging clothes when you're changing. If you have kids, go through their toys, books, and clothes and donate any items they've outgrown. Go through your medicine cabinet and throw out any expired prescription or over-the-counter medications. Toss any cosmetics and skincare products that have exceeded their recommended shelf life. Throw away old hair ties, bobby pins that have lost their plastic coating, and any other accessories that can't be salvaged. Cleaning should also extend to your makeup brushes, which can harbor bacteria, says Elsa. Replace stained bath towels with fresh new ones. If you feel like your hair-dyed towels still have some life in them, consider donating them to your local animal shelter: Some accept donations of used textiles that are in fairly good condition. Throw away old bathroom cleaning brushes or sponges that no longer get the job done. Collect any clothing, shoes, and accessories you haven't worn in the past year and add them to your donation box. You can also gather up items that are in like-new condition and sell them at a consignment or resale boutique—you'll earn some extra cash to restock your closet. Throw away any socks missing their match. Reorganize your closet by hanging clothing by type and color. Blouses can be sorted by sleeve length and collar type, for example; dresses can be categorized by style (maxi, strapless, and so on) and length. Reorganize shoes by style and heel height, and make the most of your space by storing them heel to toe, side by side. Use drawer organizers to efficiently store bras, underwear, and socks. Use boot shapers to store boots upright and keep them from slouching. Do you have any effective New Year home organization tips? Share the top things that have worked for you in the comments.